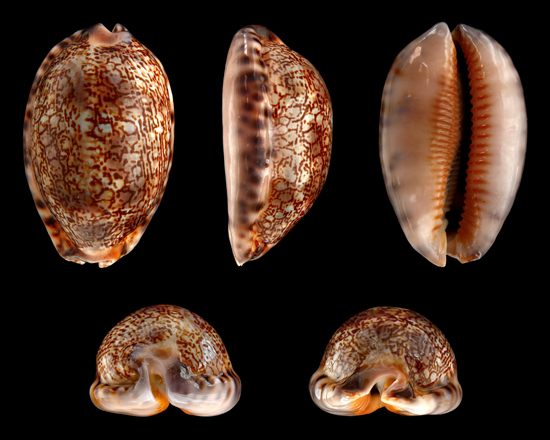 Common Name: Purple cowrie shell. Functions: 1. To calm the heart and tranquilize the mind; 2. To clear heat in the liver and brighten eyes. 1. Wind and heat in the liver meridian manifested as red, swollen and painful eyes or visual obstruction; or hyperactivity of liver yang manifested as dizziness, vertigo and headache. Purple cowrie shell (Zibeichi) is used with Chrysanthemum flower (Juhua), Mulberry leaf (Sangye) and Uncaria stem (Gouteng). 2. Palpitations, irritability, insomnia, dream-disturbed sleep or infantile convulsions due to high fever. Purple cowrie shell (Zibeichi) is used with Coptis root (Huanglian), Mother-of-pearl (Zhenzhumu) and Antelope's horn (Lingyangjiao). Cautions & Contraindications: The substance is cooked before the other herbs.